Sen no Rikyu was born in Taiei 2 (1522) in Imaichi-cho in Izuminokuni Sakai (the present Sakai in Osaka Prefecture). His father was Tanaka Yohei and his mother was Gesshinmyochin. Rikyu's family were fish wholesalers, one of the powerful merchant families (machishu) who virtually controlled Sakai. Rikyu was known as Yoshiro in his youth and later as Soeki, his Buddhist name. He was also given the name Hosensai. In his later years he was given a kojigo (enlightened Buddhist layman's title). His surname 'Sen' was taken from the name of his grandfather, Tanaka Senami. In Tenbun 7 (1538), when Rikyu was 17 years old he began to study tea under Kitamuki Dochin. Dochin was known in Sakai as a tea practitioner on a par with Takeno Joo and it is thought that Rikyu learned shoin-style tea (taking place in formal, palace-style shoin rooms) from him.In Tenbun 9 (1540), when Rikyu was 19, he became a disciple of Takeno Joo through the introduction of Dochin. Joo further developed the wabi-cha (tea of quiet taste) that had been started by Murata Shuko and established soan (thatched hut) chanoyu which was wabi-cha given in a koma (small tea room of four-and-a-half mats or less). Also, the Zen idea of 'chazen ichimi' (Zen and tea are one) had a great influence on Rikyu and the tea devotees of the time. In Tenbun 9 Rikyu's father Tanaka Yohei (Buddhist name Ichu Ryosen) passed away and in this year Rikyu began to use the Buddhist name Soeki. The first tea record that shows the name Soeki is that of February 27 of Tenbun 13 (1544), when Rikyu invited Matsuya Hisamasa of Nara to a tea gathering in Sakai. In Tenbun 15 (1546) Rikyu's eldest son Shoan (later known as Mino Doan) was born. Shoan Sojun, who was later adopted by Rikyu was also born in this year. 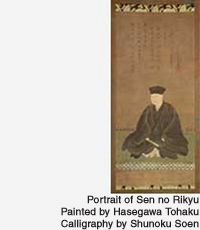 Rikyu also had daughters, who married into the families of Ishibashi Ryoshitsu, Mozuya Soan (both powerful merchant families) and Sen no Joji (Rikyu's nephew). Rikyu, who practised tea under Joo, deepened his association with Imai Sokyu, Tsuda Sotatsu and others who were leading tea practitioners of the age as well as wealthy merchants of Sakai, deepening his accomplishment as a tea practitioner.